Buckingham Palace has responded to public concerns by extending the route that Diana, Princess of Wales's, coffin will travel on its way to Westminster Abbey. The route has been lengthened to allay fears that there would not be sufficient opportunities to see the procession pass on its way to the Abbey. The route had already been extended from the funeral service to her final resting place at the family seat at Althorp in Northamptonshire. The cortege will now leave from Kensington Palace - Diana's home - which will mean a threefold increase in the processional route. The coffin will travel along Kensington High Street, past the Albert Memorial, beneath Wellington Arch to Constitution Hill and the Mall. The cortege will depart at 10.00 BST. The coffin will be carried on a gun carriage by riders of the King's Troop and escorted by mounted police. The rest of the procession will join the coffin at the Mall - as originally planned. A palace spokesman said there was no question of bowing to public pressure, but the new route was "a safe and secure way of ensuring that more people can see the procession". After the service, the hearse will journey from the Abbey to Constitution Hill. From there it will proceed slowly to the M1 along streets expected to be lined by hundreds of thousands of mourners. From Constitution Hill, the cortege will continue to Apsley Way and Wellington Arch. 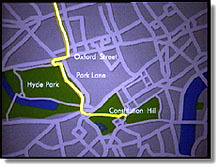 It will then proceed to Hyde Park Corner and along Park Lane, Cumberland Gate, Tyburn Way, Marble Arch, Oxford Street, Portman Street to Gloucester Place. Turning towards Lord's cricket ground, the procession will swing along Park Road to Wellington Road (A41) and then north along the busy Finchley Road. Moving into Hendon Way, it will then journey over the Brent Cross flyover, where thousands more will turn out to pay their respects. It will then proceed around the North Circular Road (A406) to Staples Corner, scene of the 1993 IRA bomb blast - to the start of the M1 at Junction 1. It will follow the motorway and leave it at Junction 15A near Wootton in Northamptonshire. A Palace spokeswoman said: "Although there is no lying in state, obviously we want to ensure that as many of the public who wish to can share in the grieving." Two giant screens will be put up in London's Hyde Park to relay TV coverage of the funeral. 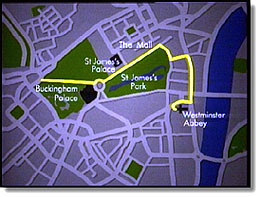 There had been growing concern for public safety and calls for an extension to the funeral route from St James's Palace to Westminster Abbey, which could be lined by up to two million people. The World At One's John Leyne reports on feelings outside Buckingham Palace Dur:1'40"
The Prince of Wales, Prince William and Prince Harry will fly back to London on Friday, and will visit the Chapel Royal at St James's Palace, where Princess of Wales's coffin is lying. The Queen, Duke of Edinburgh and Queen Mother will travel overnight by Royal Train on Friday from Balmoral to be in London for Saturday morning. Special buses and trains are being laid on to cope with the huge crowds expected for the event. However, Westminster Underground station is to be closed for fear of overcrowding. Five hundred representatives of charities linked with the Princess of Wales will follow her coffin as it makes its way on a gun carriage to Westminster Abbey. A one-minute's silence will be observed after the service, before the Princess's coffin is taken to Althorp, her family home in Northamptonshire. The funeral service will last about 50 minutes, and will be relayed to a large screen near the Abbey for those taking part in the procession to watch, and by loudspeaker to the crowds. A Palace spokesman said for practical reasons those in the procession would not be able to attend the service itself, but one further representative from each charity would be invited. A spokesman for the Prime Minister said the funeral would be a public event reflecting the fact that Diana was "the People's Princess". The Downing Street spokesman said: "The Prime Minister thinks the outpouring of grief has been a reflection of the depth of affection and appreciation that people felt for Princess Diana and that the funeral should reflect that." Even though this will not be a state funeral, many countries will be represented on Saturday. For the United States, Hillary Clinton, the wife of US President Bill Clinton will attend. France will send Bernadette Chirac, wife of the French President, Jacques Chirac. A "Unique Funeral For a Unique Person"
Royal funerals traditionally fall into three categories. The state funeral is usually for sovereigns alone, but on rare occasions has been arranged to honour exceptionally distinguished people such as Lord Nelson, the Duke of Wellington, and in 1965 Sir Winston Churchill. There is also a "ceremonial royal funeral" for members of the Royal Family with high military rank, for the sovereign's consort and the heir to the throne. The third category is the private royal funeral, for all other members of the Royal Family, their spouses and their children. Asked which category applied to the funeral of Diana, the Palace spokeswoman said: "The status is irrelevant. This is a unique funeral for a unique person." Diana's well documented divorce from the Prince of Wales in 1996 effectively removed her from the inner circle of the Royal Family and "Her Royal Highness" was removed from her title. However, as the mother of the future King, Prince William, Diana's place as a prominent member of the Royal Family was secured. She is arguably the most prominent Briton to die since Winston Churchill. Diana's funeral is likely to be a media event unrivalled in Britain in recent history. Her wedding in 1981 was seen by an estimated 700 million viewers worldwide. A spokesman for Buckingham Palace said, "The funeral will contain the usual elements of a Royal funeral, and in particular elements to reflect the affection with which the Princess was held." It is expected that members of both families would visit the Chapel Royal to see the light wood coffin, but no details were being announced. Members of the public are being invited to sign a book of condolence. It is the first time a condolence book has been opened at a royal palace in recent times. Politics97 will be providing RealAudio and RealVideo coverage, for which you will need a Player.